Can this Windows tablet get Microsoft back in the touchscreen game? There are two kinds of tablet in the world. The first is a new breed of consumer playthings, typified by the Apple iPad 2 and the likes of the Motorola Xoom. These tablets are designed for watching movies, playing games, browsing websites, creating music, taking photos and generally doing a lot of the more entertaining things laptops can do, but in a more-natural way. They're tactile, fun, light, affordable and thanks to the challenge offered by their limited input method, far more intriguing devices than their laptop brethren. Anyone that hasn't had chance to play with the likes of the iPad is missing out. A quick few moments with a copy of GarageBand should have most wondering how they can squeeze such a device into their lives. 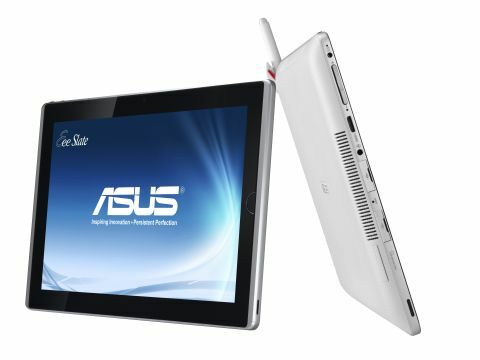 The Asus Eee Slate EP121 is not one of these machines. It belongs to another group. An older, smaller group. The other type of tablet isn't aimed at consumers. It's been tried, but ultimately it failed to make an impact with the general masses. The last big push to get such machines in the hands of users was back when Windows XP was all the rage, and while some swore by their versatility and natural inputs, most simply swore at them and walked away. This traditional Windows tablet is still alive, although only as a niche for those industries that need the machine's compatibility and also require the tablets natural input methods. These machines are used for showing PowerPoint presentations, for using in the field where a keyboard wouldn't be practical. They're also used by artists and designers, where the combination of a stylus and a touchscreen combine to make for a far more intuitive working experience.